This 2-stage snow thrower is perfect for clearing larger driveways. Power through wet heavy snow easily thanks to the 272cc Columbia OHV engine. In-dash light offers improved visibility in low-light or snowy conditions. A three year limited warranty allows peace-of-mind while being backed by our Canadian Guarantee. 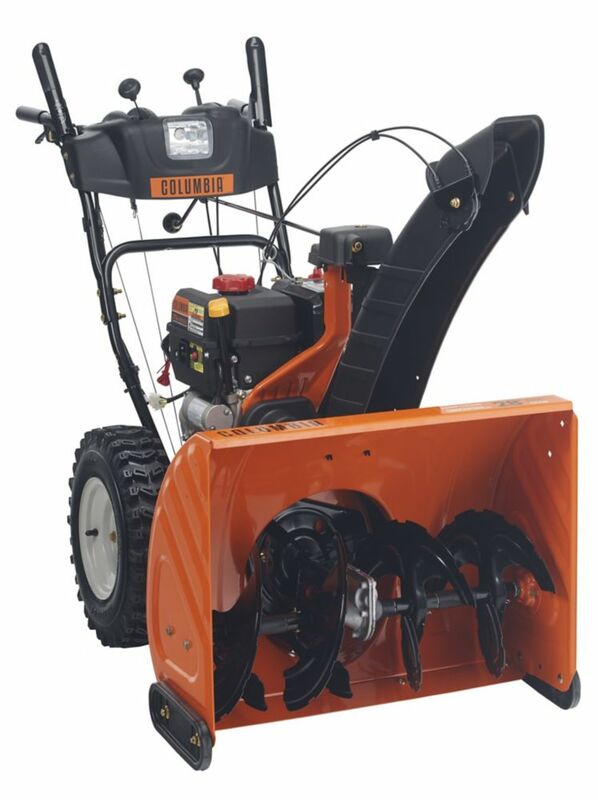 The Jonsered ST2361EP 24-inch dual stage snow thrower delivers high-performance to clear snow from large driveways and paths. It works regardless of surface type thanks to the adjustable skid shoes. It has an efficient two-stage system with the capacity to throw snow up to 50 feet. The handle has adjustable height for comfortable use. Friction-disc transmission ensures smooth operation. Features heated handle grips, headlights and electric starter for work in all weather conditions. Deep, heavy snow is no match for this rugged, high performance two-stage snow thrower featuring LED lights for increased visibility, and a large 34" clearing width. The steel chute throws snow farther away using the OVH crank with remote tilt for better rotation control. Heavy duty tread X-Trac snow tires maximize traction and deluxe polymer slide shoes protect your driveway from marks. Powerful performance and convenience are what you can expect from this snow blower. Its push button, electric start engine and variable speed let you handle your work with ease. The ergonomically designed machine comes with foldable handles, making storage easy when not in use. Powerful performance and convenience are what you can expect from this snow blower. Its push button, electric start engine and variable speed let you handle your work with ease. The ergonomically designed machine comes with foldable handles, making storage easy when not in use. The LED headlight allows snow blowing in the dark. 26-inch 277cc Two-Stage Snow Blower This 2-stage snow thrower is perfect for clearing larger driveways. Power through wet heavy snow easily thanks to the 272cc Columbia OHV engine. In-dash light offers improved visibility in low-light or snowy conditions. A three year limited warranty allows peace-of-mind while being backed by our Canadian Guarantee. 26-inch 277cc Two-Stage Snow Blower is rated 4.5 out of 5 by 2. Rated 4 out of 5 by Fireguy67 from Decent mid - sized snowblower Bought this after we had a large dump of snow. Of course it took a few weeks to arrive so naturally the snow was gone by the time it arrived. Very sturdy well constructed blower. Only 4 stars because I really have not been able to put it through it’s paces. Will review it again after a decent snow fall next year. Bought it because both reviews and price were very good.